I have a separate class where I set the settings argument. The last two setting items are for: AVLinearPCMIsBigEndianKey and AVLinearPCMIsFloatKey. Their values need to be NSNumbers so I was using [NSNumber numberWithBool:], but instead of passing in "YES" or "NO" I was passing in TRUE and FALSE, which is INCORRECT. Just one of those oversights I forget about when switching from one language to another. I am still not sure why my NSError wasn't populated with some information. I don't know why the initializer didn't catch my syntax error either. After I made my corrections, the recording worked perfectly. Whew! Now I just need to write the playback portion. Back in April I wrote a blog post discussing my concept of having a dynamic site using the Zend Framework. In addition, I posted an some example code of how everything works. I am a firm believer that one should practice what they preach and two different sites are now in production using the framework that I wrote and so far it works beautifully. I had to make a few changes to the route to allow for module exceptions. Towards the end of the project there was a request to have a search functionality and also custom forms. Normally this wouldn't be an issue what so ever, but the way that the custom route is setup all requests are send to the default module/index controller/index action. I modified the route to ignore any request that started with search or forms and route those requests to the search or forms module. The regex is easily modified to allow for other exceptions. I also setup the ability to add in meta keywords and meta description tags in the content.xml file. Finally, both sites use the EXACT same doc root and dynamic site framework. Since both sites use the same layouts, just different menus and different background images, I didn't want to duplicate a lot of code. So in the setup page display plugin I am able to transverse the content mapping file based upon not only the request, but the url host name to display the proper layout. One of my favorite iPhone related sites to read is iPhone Developer Tips. The tutorials are outstanding and most importantly "real world" useful. Back in August there was a blog posted showing how to implement a "slideable" message that can be presented to a user. After reading through it I decided to modify how it was used to make it a little more extensible for an iPhone project that I am working. After I got everything working correctly and they way I wanted to I decided to contact the site owner, John, with all of my source code in case he wanted to use it. After a little more tweaking to my code he posted my changes, as well as another developer, Greg's code in a new post. This is a small example of the importance of using open source software, as well as, the importance for developers to use the knowledge and skills of other developers to make the good....GREAT. Tonight I got an email from a friend that my site was down. Sometimes, if Apache has been running for a long time on my vhost then for some reason the process id gets corrupted. I don't know if that has to do with the VPS or what. I never had that problem when I had my dedicated server. It happens so infrequently I rarely even notice. However, my usual task of just restarting Apache didn't work. I got an error message that the main site's docroot didn't exist. That was very strange and very disturbing. I got on the phone with the sysadmins at my hosting company and couldn't really find the culprit and they didn't have the automated backup of the site. The good news, as I was told, was that they could recreate the directory structure within one minute and get Apache up and running. SWEET! However, what about my site?! Though they offer backups for the VPS they are not guaranteed. I was not panicking because I keep all site changes backed up in subversion on a completed different host. Once the directory structure was put back in place all I had to do was check the latest copy of my site and I was backup and running. It was good to see and know that using best practices does ACTUALLY work. Imagine that. When presenting an app to user with a large list of information, most developers will add in the ability to search the list inside of the table view. To further increase usability it is a good practice to include different filters. For example, a scope button that allows the user to filter by name, address, phone number, etc. Implementing these features is pretty straight forward. However, one of the filter options that was needed for a particular app that I am working on was to filter by department. The complexity to this problem came in the fact that the search term couldn't be the department name, but the code. Obviously, most users don't know the corresponding codes for a given department. So I needed a way to present a list of "friendly" department names to the user to pick from, and once a given department was chosen then the corresponding department code would be populate the search bar field. The first attempt was to use a UIPickerView. Unfortunately, this wasn't the best solution mainly because you can't use key/value pairs with the UIPickerView. Well...not in a very straight forward manner. My second solution attempt was to use a modalViewController and then pass the selected object back to the parent controller. Everything worked out just fine, but the parent object property wasn't being updated. To solve this problem there are a couple of schools of thought. Set the parent controller as the delegate and setup a new protocol that the child controller implements. Use the NSNotificationCenter which uses the Observer Pattern to update another object based upon some action/method. After a user selects the appropriate department, the child controller is dismissed and the search bar text is updated with appropriate department code. 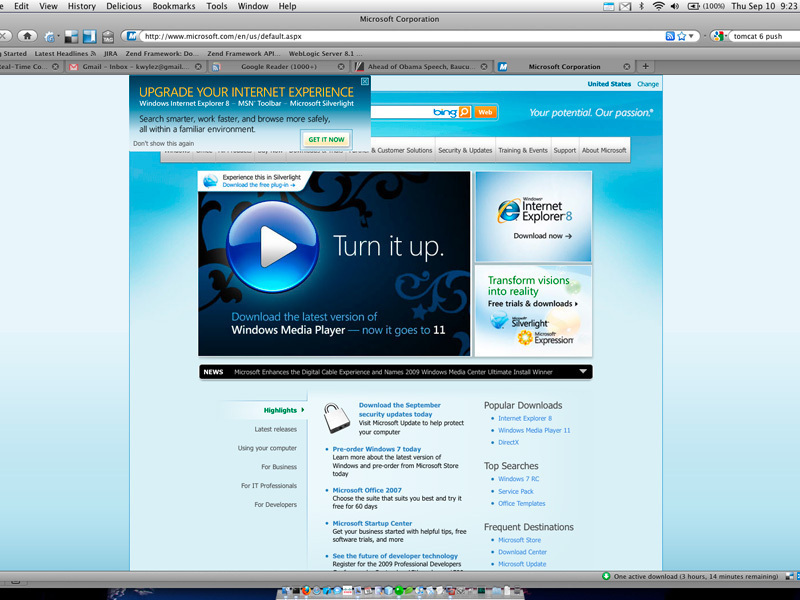 I read a very interesting article yesterday that ranked the usability between Apple's website and Microsoft's website. Granted, I am a little biased toward Apple, but I do feel that the author did a great job in their comparison. *spoiler: Apple won. To add to the critique the Microsoft website does something that is a HUGE pet peeve of mine. If a company claims to be in the "web" business then they need to create websites that look the same in all browsers. Microsoft has a HORRIBLE reputation on releasing browsers that are not standards compliant, but are constantly giving non-IE users who visit their websites a second rate experience. Case in point...their own website. If you go their website with anything other than Internet Explorer, the visitor is presented with this ANNOYING alert in the upper left hand corner that is asks if you want to "Upgrade your Internet experience". After few seconds it does minimize, but if you don't click the "Don't show me this EVER again link" the next page you navigate to will show it. The fact is that I do want to upgrade my internet experience, but not by installing Silverlight, or IE7 or IE8 for that matter. All of the before mentioned pieces of software are horrible, lack innovation, and do nothing but dumb down the web. I want to upgrade my internet experience by not being harassed by Microsoft. Adding followers to a user one at a time is sometimes a VERY lengthy process. Last night the question was posed to me if there was a way to automate adding followers from users who follow someone else. Unfortunately, the Zend_Service_Twitter class doesn't offer any functionality to retrieve a list of followers from another user, but I was able to extend the class and add the functionality. I plan on submitting the feature request to the Zend Framework gurus to have the ability to find followers from other users so that it can be apart of the main service. Google Interview - Could You Pass? The gold standard of programmer interview questions. It is not what they ask, but how they ask them. It seems that in the past six months there has been more and more news, examples, and excitement concerning HTML5 and CSS3. I must say that I too have been bitten by the bug. What features that I have seen makes me very excited about the future of web development. It is time to get back to basics and standards. However, because both are their infancy as far as adoption, not all browsers support the new technologies and the ones that do support them don't support all the features of HTML5 and/or CSS3. Being, what most people consider, an earlier adopter I am going to be converting www.corywiles.com over to HTML5 layout using CSS3. In order to not shut out those of you who don't have a supported browser, I will keep the old layout around until the percentage of those browsers falls below 5%. Over the past two months I have been approached to develop at least three different iPhone apps. Two out of three clients weren't as shocked with the price as they were with the time line. While each developer out there has a different level of expertise, I would say that your average iPhone app will take 2 - 3 months of FULLTIME development and then at least 7 days for Apple to approve it. Let me reiterate that the previously estimated time frame is not only a conservative estimate, but also based up a fairly simple app. To define fairly simple, let's say that you want to have an app where you can search a database for a list of people based upon different criteria: name, age, state and country, have those displayed in a list where a user can then select one of the search results, view the person's complete detail information, and have the ability to copy that user's information to the phone's contacts. Not that complicated as far as the requirements go. However, once you start writing the app you will realize that as a developer you need to consider the asynchronous loading of the data, connection speed (Wifi, 3G, Edge or none at all), caching, processor limitations, memory limitations, phone orientation and interruptions of the app. For example, what if a call comes in while your user is trying to perform a save operation in the application or how should the app perform if there is a memory warning and/or crashes). You have to keep those, and more, in mind just when you want to display a simple list of data. Finally, after you have all your functionality worked out and you think that you are bug free the REAL fun begins. The software that is used to develop for the iPhone and Macs has profiling and testing features. At this point, the developer starts really digging into the bits and bytes of the app to make sure that it is not suffering from memory leaks, releasing objects too early/too late, and overall performance. While the phone itself is VERY powerful, it is still a mobile device with limitations. iPhone applications, in my development experience, are not usually offered as a standalone product or service, but as a companion to an existing or large product and/or service. As a consequence, I have seen many applications rushed out the door on time for what was an unrealistic deadline. The is usually driven by release date of the "big brother" to the application, which was set to meet a profit projection. However, if the natural mobile development time is not taken into consideration then the app doesn't reach it's full potential. At this point everyone loses. If you decide that you want an iPhone app, and one that works, plan it taking sometime to develop. Manage the expectations.